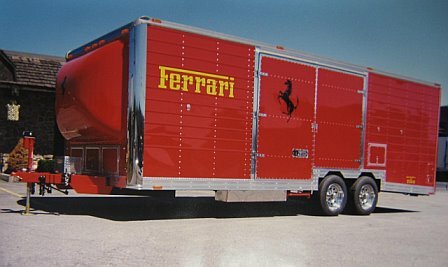 "World's Finest Custom Ferrari and ViperTrailer"
C & C Manufacturing Co. started in 1962 in steel fabrication. In 1972, we expanded our business to include manufacturing trailers. can be found by clicking "Learn more about C & C on the left. Our factory has evolved from building car carriers to luxurious trailers. Now for the best news! After a few years of designing the *Sports Model for all types of cars.We adapted all our exclusive Ferrari, Viper etc. appointments from our commerical trailer to the *Sport Model Trailer. The *Sports Model trailer was designed and engineered to the most stringent standards by C&C Mfg.and subcontrated to C-mate Industries.Then the unit is transformed to our Exclusive appointments that match and go beyond the commercial unit.This resultes into a 30% savings on the price of the trailer,with delivery time frame down to 8 weeks. John Giedosh -- Plant Super..